A film reviewer, a poem dabbler and an admirer of words. They are funny things aren't they? Words, where would we be without them? On TV probably. 'Argo' hits the cinemas in two weeks time in the UK and I had a sneak preview of Affleck's latest offering as he stars, directs and produces this interesting production. Ben Affleck returns in this gritty, political drama starring with Bryan Cranston, Alan Arkin and John Goodman. Ben also directs and produces this film. This is the third time he has spearheaded a production after directing, writing and producing 'The Town' and 'Baby Be Gone'. I believe 'Argo' is his best motion picture with himself at the helm. The script is brilliantly adapted from true events as the film is closely based on the CIA operative Tony Mendez's account of the rescue of six U.S. diplomats from Tehran during the 1979 Iran hostage crisis. The screenplay is skilfully written by Chris Terrio and intelligently directed by Affleck as they both expertly combine to create a thrilling, political drama that deals with nerve-racking suspense mixed with some wayward humour every now and then. It is a very difficult task to input comedic lines into such a serious film without belittling the hard-hitting subject, but 'Argo' uses these specific jesting lines to break the suspense for a short while, ready for another scene to re-mount the tension. As I watched this film, I found it hard to believe this actually happened. Because of my lack of knowledge on the crisis, I was watching 'Argo' thinking Affleck and Terrio have bent the facts a little to make a more interesting narrative but you realise just how close it is to the real events during the credits as it reveals actual pictures and footage. I think Ben Affleck deserves a lot of credit for this movie because he took on a very difficult, and may I add different, project to his last film 'The Town'. The daunting task of creating a film that has so many eyes scrutinising the production due to the severity of the real-life crisis it depicts is intimidating enough, but Affleck pulls through and produces what I believe to be a real contender in the award seasons. The cast was formidable with the likes of Alan Arkin, Bryan Cranston and John Goodman joining Ben Affleck on this movie. Bryan Cranston contributed a remarkable performance as Jack O'Donnell working for the CIA with Tony Mendez (Ben Affleck). Affleck and Cranston's chemistry was joyful and polished as they worked together, argued and had some gentle laughs. John Goodman and Alan Arkin were great supporting actors too, really capping off a great production. 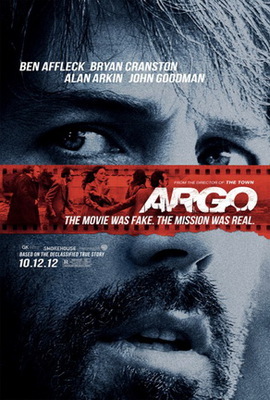 To sum up, 'Argo' is a dark and thrilling film that centres on a difficult subject to depict. I think Affleck and crew do a phenomenal job squeezing in over a year's worth of footage and facts into an exciting, nerve-racking, two-hour feature film. I believe 'Argo' is worthy of a mention to potentially creep into the Academy Award shortlist for the 'gongs'. It definitely has all the ingredients to be a successful Oscar-winning film but I am sure there are many more films to be released to rival this work of genius by Affleck and Terrio. Ben Affleck really has come on in leaps and bounds in my estimation in the last five years.